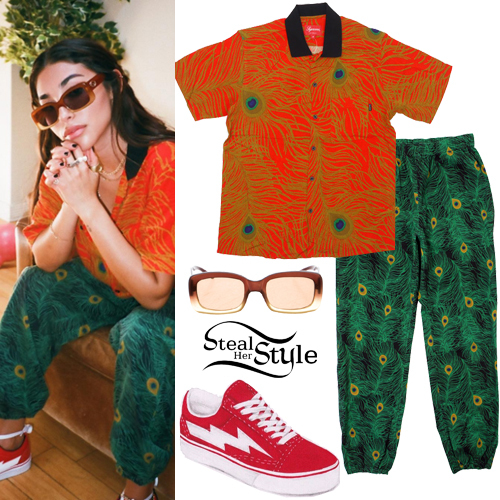 Chantel Jeffries posted a picture on instagram wearing a Peacock-Print Shirt (Sold Out) and Peacock-Print Pants (Sold Out) both by Supreme, Gucci Ombre Square Sunglasses ($125.00 – preowned) and Revenge x Storm Vans Sneakers ($200.00). Madison Beer was spotted arriving at Organic Shimmer tan salon in Los Angeles wearing a Shadow Hill Marlboro Man Hoodie ($75.00), American Apparel Interlock Running Shorts ($22.00), a Saint Laurent Monogram Croc Envelope Satchel ($2,250.00), Natasha Couture Genuine Rabbit Fur Bag Charm ($68.00 – wrong color), a Revenge Pendant w Iced Tail($160.00+) and Vans Old Skool Sneakers ($60.00). Madison Beer arrived at the PrettyLittleThing: Shape x Stassie Collection Launch last night wearing the RtA Lilou Off-The-Shoulder Dress ($395.00), a Revenge Pendant w Iced Tail ($160.00+), Love Wedding Bands in White Gold ($1,140.00), Yellow Gold ($1,070.00), Rose Gold ($1,070.00) and Love Bracelets in White Gold ($6,750.00) and Yellow Gold ($6,300.00) all by Cartier, and Dsquared2 Riri Sandals ($955.00). 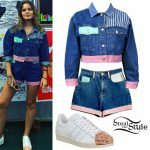 You can find similar shoes for less at Simmi ($56.00).